I picked this up yesterday for $200. 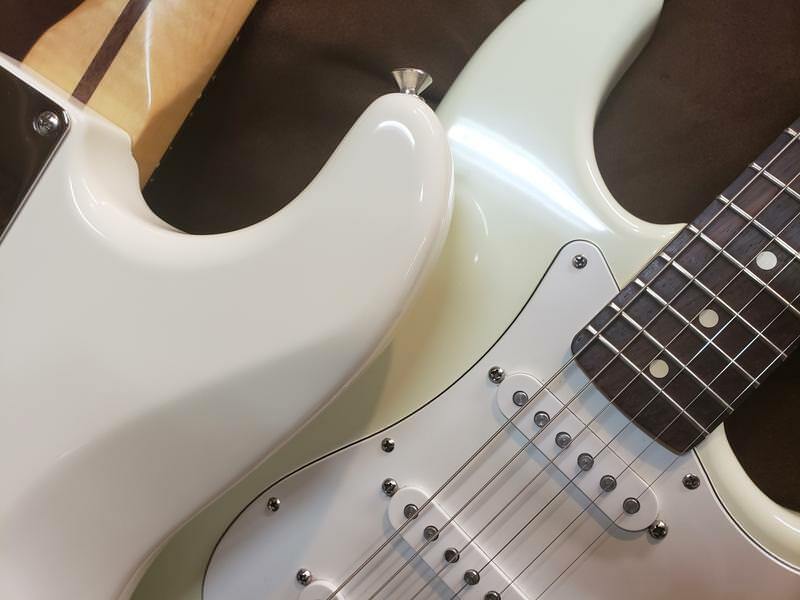 It is a 2014 Standard Stratocaster. It's made in Mexico and it's Arctic White. I got a Fender branded gig bag with it. I have owned one of these before...I think it was a 2012 and a black finish but the same model. So far I am loving it. I like the bassy punch the pickups have. The action is smooth and the condition is excellent. One thing that is cool about the guitar is how much flame there is on the maple neck. I wish it didn't have the rosewood board because then all of the flame could be seen from the front. 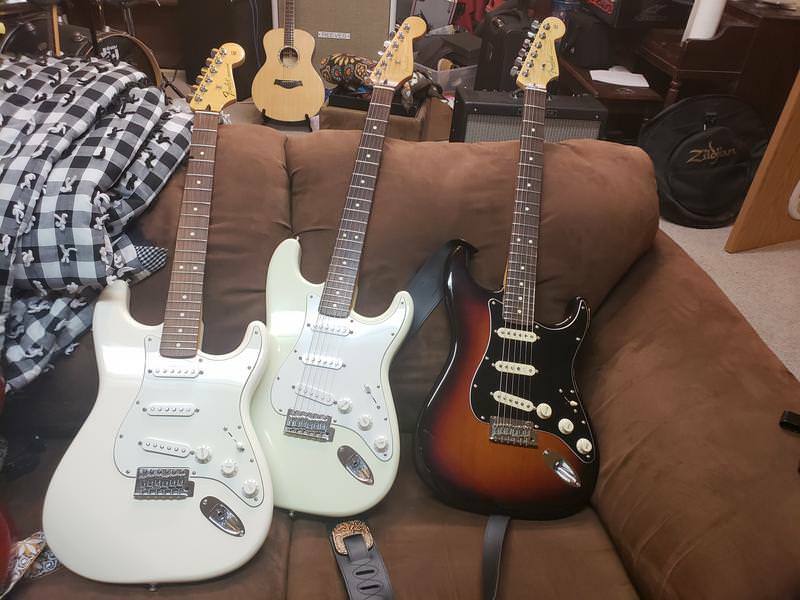 I have 3 Strats and there is a pic below of the 3 together. 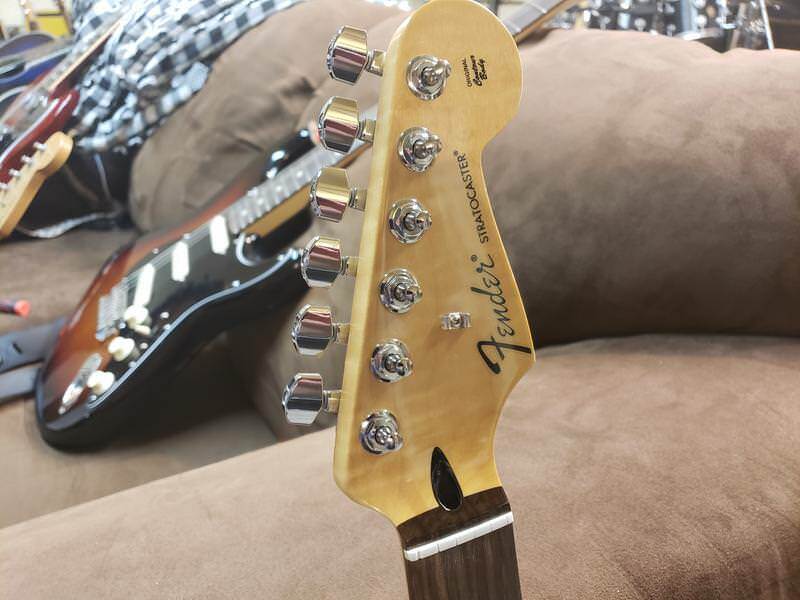 The new MIM Standard, my Wayne's World 2 Strat, and my American Standard. I also have a Johnny Marr Jaguar.....I put that pic just to show the white Fenders I have. The last pic is to show the difference between Arctic White and Olympic White. 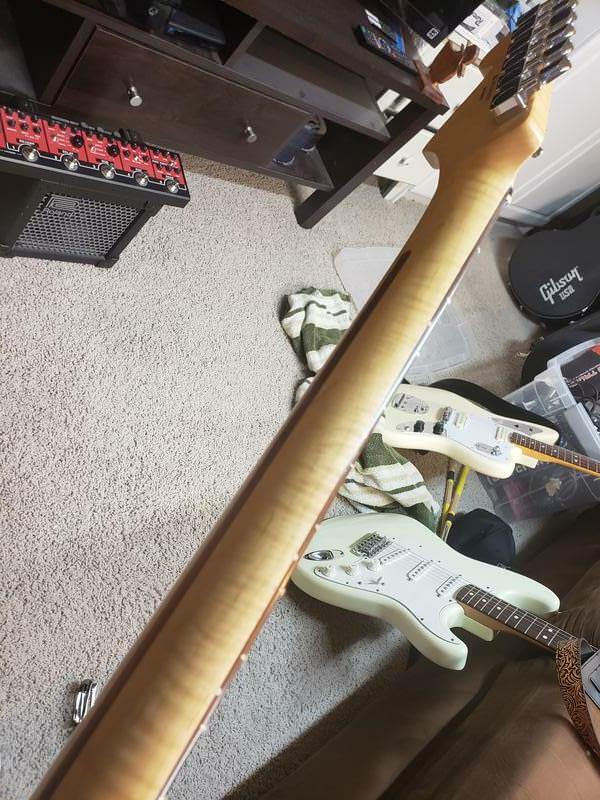 I have a Wayne's World II Strat, when I got it I didn't like the greenish tint to the finish (early days of Mexi production, many of the finishes looked a little off), but I did like the tinted neck. 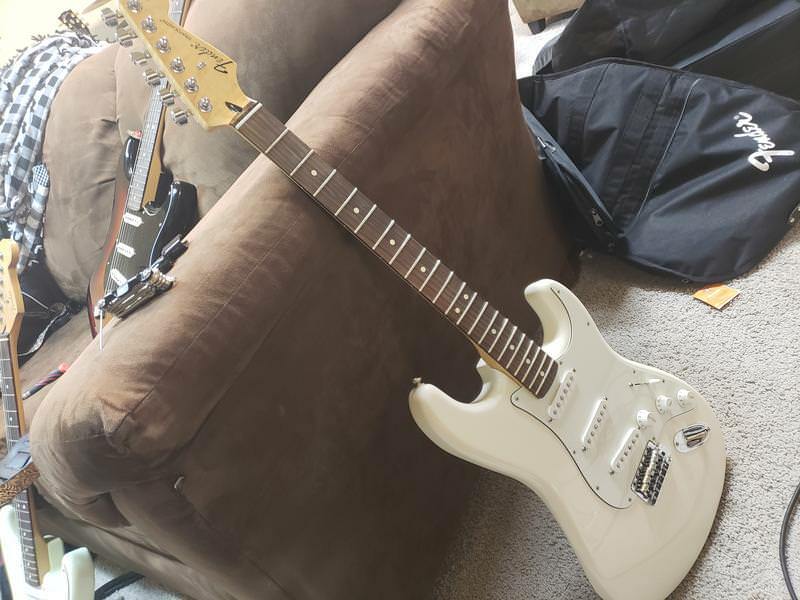 I found some cracks running from the 6 trem mounting screws, so took it to an authorized Fender service guy, he got a brand new body from Fender, which had the proper Oly white finish, and I think it may have been a USA body. At any rate, I liked the finish much better, the only things I didn't like were the modern C neck profile, they are a bit too thin for me (but I've learned to live with it until I can get a replacement neck with a more rounded profile), and of course the pickups, which I changed out with an old set of Duncans, SSl-1 in neck and middle and SSl-5 in bridge, which I have had in 3 different Strats by this point. The finish has aged nicely, and it has been my main Strat for years. 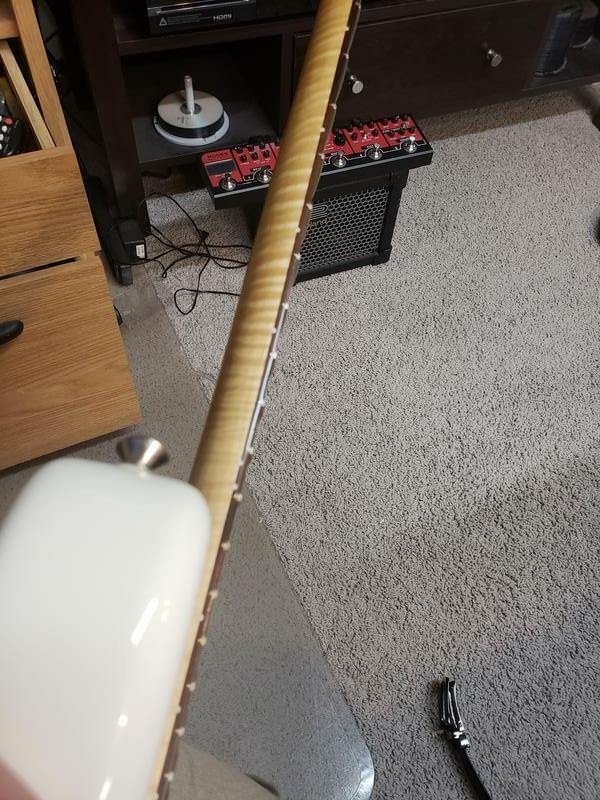 Still going to upgrade some of the electronics, thinking of no-load tone pots for one thing, but it's been a good guitar. Some players have asked me if it's a vintage Strat!. Got the trem dialed in, it has a steel block on it now and with the Duncans (which are vintage by now), it sounds really good. It cost me $275 new. Quite a nice piece of wood on the neck. I own 4 or 5 MIM Strats. My oldest is a '96. Why would I want to pay for an MIA when you can get MIMs in the $200 range? Nice neck!!! Very nice @Dirtyclinic...congrats! 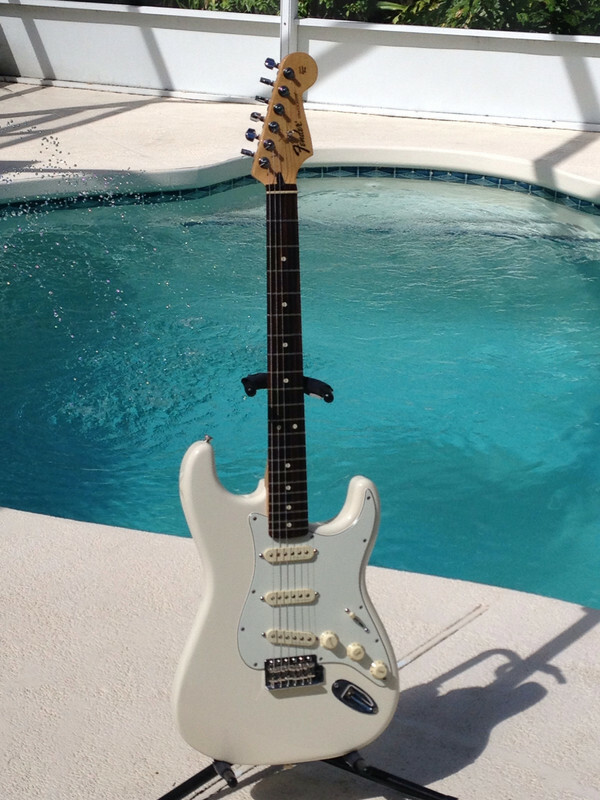 I love white Strats with rosewood fretboards! I bought a 2015 MIM Strat a couple of years ago. The previous owner did some nice upgrades and it plays and sounds great! Nice. I was thinking I would put the MIA pickups from my American Standard Strat in this but I am actually really liking the MIM pickups. I do want to put locking tuners on mine though. Yeah, I am loving the MIM Strat. I own an American Standard though and I have it just because I wanted it...The value of the MIM is the best deal around and purely as a player is a total no-brainer. I agree....MIM Strats are a great value. I’ve had MIA Strats and they’re great guitars, but I think these are a better bang for your buck! Nice! I like my Wayne's World 2 Strat. The body of mine might be from the Original Wayne's World Squier run because of the back plate, the screw holes look like the Squier style. I think some Wayne's World 2 Strats got leftover bodies from the Original run a few years earlier. I also like how the neck doesn't say "Made In Mexico" on it, it does have the Mexico Serial Number though. Fantastic, love that white! I have a MIM Jimi Hendrix model and it looks white like that. Beautiful guitar you got. 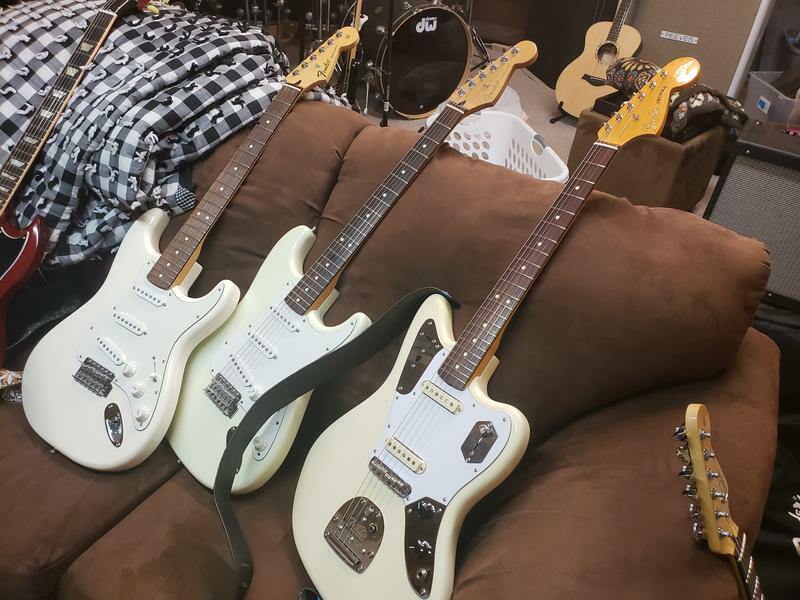 I own a few MIM Strats and a few USA models, there is a difference but not so much that detracts from fun levels.